You can use our innovative tools and services FREE and build your own business like a guru. With our webtools and ad widgets, we've amassed an advertising network covering 6,000+ websites, with daily ad impression of 400,000+. 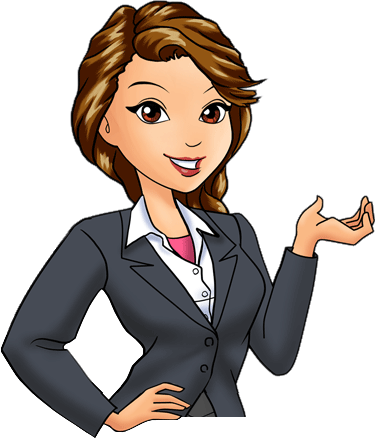 You can advertise FREE and get Real Visitors who are interested in your offers. We design our program in such a way that you can automatically make some money while using our services and getting traffic. Our main income source comes from TRAFFIC GENERATION. That's how we get the money to maintain multiple servers to power the free tools we provide you. Since TRAFFIC GENERATION is our bread and butter, you bet we are doing everything possible to make it work better and better! I'll explain the 4 ways we use to bring you traffic and leads. You decide if they make sense to you. Your ad will be shown to our members. Our members are incentivized to view your ads. "So, this is just another traffic exchange or PTC program, where members click an ad, wait for the 10-20 second timer to lapse, then move on to another ad to earn more credits." No. Such a system is flawed. In such a system, what will you do when the timer is up? This kind of system pushes visitors away from your ad after 10-20 seconds, instead of encouraging them to stay and learn more about your offer. As I said, we have a unique system to measure the visitor surfing duration for 3rd-party links. With this system, we know who are really surfing and how long they surf. We reward members based on their surfing duration. The longer they surf your ad, the more credits they earn. So, if your offer is interesting, they are 'incentivized' to stay and find out more. Read our blog and see what others say about our unique ad viewing system > READ HERE. "Come on, isn't it still a member-view-member-ad system?" Our members include affiliate marketers, website owners, bloggers and individuals looking for ways to make more money and get more traffic. Are they your target audience? If your answer is YES, why stop yourself from reaching out to them? "Wow! I'm blown away at how Kenneth Koh, LeadsLeap founder, has constantly taken this program to new levels. Honestly, I have only been using this system for a few months, but the utility of the Leadsleap program never ceases to amaze me. When I check my advertizing to see which ads are performing the best, Leadsleap is always at the top of the list in sending me lots of traffic." Ok, I am exaggerating when I say advertise to the world. What happen is we run a PPC program. We reward publishers and marketers to show your ads on their websites and in their tracking links. Our ad impression is more than 400k per day. Our ad widgets are shown in > 4000 websites/blogs and > 30000 trackers that are show in most popular traffic exchanges, PTC programs, safelists and forums. Is this the industry you want to target? If your answer is YES, then we offer you a shortcut to reach out to the entire industry. "LeadsLeap is light years ahead of every other lead generation tool I have used. The tools are easy to use, and they are absolutely unique :-). LeadsLeap has produced quality traffic for my other half's blog, which is in a very small and specialized niche. It also produces quality signups for every program I have advertised to date. I look forward to using LeadsLeap for a long long time!" One of the proven ways to get quality leads is by writing product reviews and getting traffic from the Search Engines. LeadsLeap operates a search engine optimized Social Review Directory - Take a look at it HERE. If you think any kind of content will rank well in the Search Engines, think again. LeadsLeap.com is an aged authority site. But that's not good enough. The Social Review is a consolidated review directory, with fresh reviews being added from time to time. It is a good resource for people looking for different reviews from real users. That's why your reviews in our Social Review can rank well in major Search Engines. "Social Review is incredible! I’ve already received a lot of clicks for the programs I’m promoting. The review for one of my programs is on the #1 page in Google’s search results. It’s a very good way for generating an endless stream of traffic for our sites!" LeadsLeap system comes with a 10-level network builder. Imagine if you refer 10 people to LeadsLeap and they do the same, you will have 100 extra followers at Level 2, 1000 followers at Level 3, 10000 followers at Level 4...... and 10 billion followers at level 10! Realistically, it's much lower. But still pretty explosive! You may be wondering, "Is this MLM?" Our 10-level network is only for leads building purpose. Our program is free to join. Our affiliate program is a basic affiliate program. No purchase or maintenance needed. "Is this a safelist? Will I be flooded with tons of emails?" We are NOT a safelist or mailer system. Members can't email members. "Then, how do I contact my 10-levels of followers?" We have a unique, sustainable and annoyance-free communication system that allows you to reach out to 10 levels of your followers unobtrusively. This system is more effective and more sustainable than member-to-member email or private message. "This Downline-Text-Message feature is a really intelligent way to stay in touch with your people without annoying them, and yes, this feature goes 10-Levels deep. So you will not only be able to reach your personally referred people, but all they refer, and all they refer, and all they refer, and so on until the 10th level." 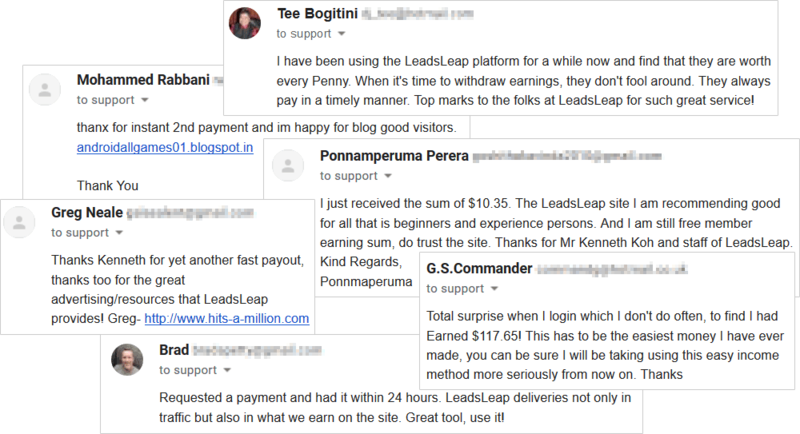 "When I first joined LeadsLeap, I really didn't know how well it would work but figured it's worth a try. I've been a pro member since the first day I joined, and looks like I will stay this way til the end. The traffic has helped a lot, the downline messages have generated buyer leads, and the commission of $137.88 today makes it even more profitable. It has opened new ways for my blog to be profitable as well, so why would I ever stop using this platform? Great job on creating LeadsLeap, I'm glad I made this decision." LeadsLeap is driven by innovations. Since our products and services are free to use, our innovation becomes your competitive advantage. In this competitive market, the ones with the most resources win! These are the resources you can find in your FREE LeadsLeap membership. If you've read some LeadsLeap reviews, you're very likely to see bloggers raving about our unique link tracking system. Because it is probably the only tracker that allows you to track the surfing duration of visitors to your affiliate links or third-party links. You see, conventional link trackers only track clicks. They can't tell whether the clicks are real visitors, how long they have surfed on your site and whether they have taken actions. You may be thinking, "Well, there is Google Analytics." Google Analytics only works if you are the webmaster. If you want to track a third-party link, such as an affiliated link, you can't! But with The Real Tracker, you can! Why surfing duration is important? You see, bots nowadays can simulate human visits and fool trackers into believing that they are real. Trying to fight with these bots is not easy. Their sole objective is to generate visits that look real to normal trackers and cheat your advertising money. If you can measure the surfing duration of your visitors, you can effectively figure out whether the traffic you're getting are real visitors. What can The Real Tracker do? With The Real Tracker, you'll know long your visitors have actively surfed your links, whether they have taken any action, and many other tracking stats. But that's only the tracking aspect. You can insert opt-in popup into the links that you track! Yes, even if you don't own the site! This means you can build your own list while promoting other people's product. You can add an ad bar and cross promote other offers to any link you track. You can rotate those links, add different weightage and different limit for different links. You can create tracking sources on the fly, no need to login all the time! Our members LOVE this tracker! From time to time, we will receive emails from members telling us how they manage to get refunds from websites that sell them bogus traffic. It is no secret that popups can increase the conversion rates. But most of the popup generators in the market are either expensive or full of bugs. And honestly, they are not as powerful and customizable. The popups are responsive and mobile friendly. You can add it to your website or blog. You can even add it to your Link Tracker! This means you can basically add a popup to your affiliate links and build your own list while promoting other people's program! Still not convinced? How about try out our Popup Creator now? Honesty, this is just a basic list management system. Not much to brag. We added it because several members ask for it. They want to build a list, but are not ready to pay for professional autoresponder services like Aweber or MailChimp. They asked us to help, so we do. This is your personal list. We will not send any promotional email your list. The last product is the one that is going to separate the men from the boys. It is a full-fledged, self-hosted, unencrypted PHP Script. It allows you to build your own sales funnel and run an online business like a pro. First, you giveaway a free product to entice people to opt-in. When they opt-in, you give them an irresistible one-time offer. If you have a good deal, one-time offer converts like crazy! Your leads can then offer the free product to their leads, via their affiliate links and make 100% commissions from the one-time offer. This is a superbly viral way to grow your leads. 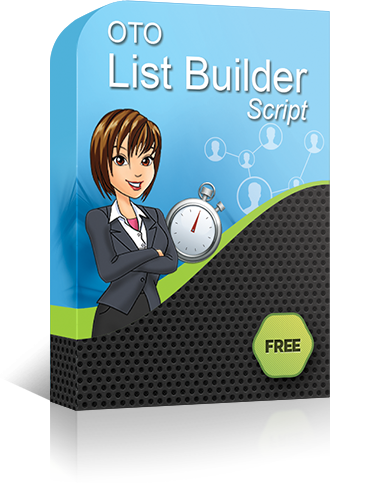 Note: The OTO List Builder is not some kind of PLR script. It is developed and maintained by our team. Whatever technical challenge you face, we are here to help. "Hi, I want to say great job to Kenneth as he ventures off and leads the way to many new and veteran online marketers. This piece of software has been solely responsible for me being able to build a mailing list of 25,986 subscribers in one year and 2 months. Each one of them came as a result of the script. I have been able to turn some of those subscribers into customers while providing them relevant value packed info." I don't want to mislead you into thinking that you can make a lot of money with LeadsLeap. Truth is, our members only make modest amount of money. ... and many of them make it unintentionally. You see, when you use our webtools to build your own business, you are indirectly activating the 4 ways described below and making money automatically and passively. Just focus on building your own business. Making money with us is inevitable. You can be an active member with just 10 ad clicks a day. It can be your personal click or third-party clicks via your ad widgets. As an active member for the day, ALL your credits earned during that day will be used to calculate your 'Daily Active Bonus', which is derived from 5-10% of our daily advertising income. No, you don't have to pay a cent to participate in this program. Every member is eligible. It is our way to say 'Thank you!' for being an active member. There are many ways to earn credits. Actively, you can view ads, rate ads or report problem ads to us. Passively, you earn credits when people view ads via your ad widget and earn overriding credits from your 10-levels of followers. So you know that you can earn credits, actively and/or passively. If you are an advertiser, you can use these credits to advertise for free and get targeted traffic to your sites. If you have nothing to advertise, you can convert your credits into cash. Why do we allow members to encash their credits? We are serious about the quality of the ads posted in the network. If we don't allow members to encash their credits, they may simply advertise anything just to get rid of their credits. This will degrade the ad quality in the system. You should be familiar with PPC program. Many advertising platforms pay you to send traffic to their advertisers' links. We too, except you can do it with or without your own website! If you have a website, you can add our ad widget to it. When people view the ads, you make money. Don't have a website? No problem. You can use our link tracker to track your traffic elsewhere and enable the 'Monetize' option. When people visit the ads, you also make money. While most of our services are free, we have dedicated some advanced features that are only available to our Pro Members. These features will help them to get more traffic and leads. When your referrals upgrade, you make 25-50% commissions. These are recurring commissions, i.e. you get paid every month as long as they stay as a Pro Member. Your referrals may downgrade sometimes and upgrade again. It's normal. But whenever they upgrade, you will earn a commission. Their upgrade commissions will go to you for life. Founded in 2008, we are still paying some of our founding members commissions! LeadsLeap is built to last because we provide real values in an evergreen niche. Every effort you put in LeadsLeap will only multiply in the future and reap you more leads and profits automatically. "Kenneth I want to be honest with you. Over two years ago I got fed up with advertising in the only niche I have ever been heavily involved with (safelists and traffic exchanges). I cancelled all my hosting. I let all my domains expire. I cancelled all Paypal subscriptions/upgrades including pro membership here at LeadsLeap. I was away from internet marketing for two years and one day got an ad in my personal Gmail inbox. I was interested and when I clicked it I noticed the teaser, ad-bar timer and the footer popup. I couldn't resist and clicked "advertise here" knowing it would bring me back to here. You must know that I was very fond of Leadsleap. Naturally I was curious and checked my earnings and referrals. Over two years without logging in, I had $185.00. I got a total of 2700 followers and tons of credits >>>> AMAZING!" Secure Your FREE Membership NOW! Loading a lot more testimonials.